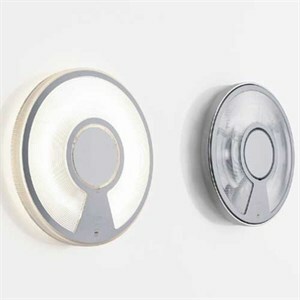 The main photo shows the transparent ring with frosted diffuser on the left and metallic ring with transparent diffuser on the right. Design Alberto Meda and Paolo Rizzatto 2002 A plastic luminous disc consisting of two polycarbonate shells, particularly well adapted to the latest generation of slim, circular fluorescent bulbs. The lamp is so thin that it merges imperceptibly with the surface of the ceiling or wall. The use of injection-molded polycarbonate for the body allows the LightDisc to be made from a single material thus creating a visually simplified whole and reduces the connecting points between parts. Choose from a frosted or clear diffuser; and transparent or metallic ring (the ring encompasses the perimeter of the fixture). The transparent ring creates the halo effect around the fixture, when illuminated. The finishes, transparent and metallic are created simultaneously in the mold by using the new "in mold decoration" technology. Suitable for use outdoors and wet locations. Dimensions: 16" D X 2.5" Extension. Uses 1 X 40W 120V T5 2GX13 based circline fluorescent lamp.